Exocrine - which make powerful enzymes to digest fats, proteins, and carbohydrates. The enzymes normally are created and carried to the duodenum in an inactive form, then activated as needed. Exocrine tissue also makes bicarbonates that work to neutralize stomach acids. Endocrine - which produce the hormones insulin and glucagon and release them into the blood stream. These hormones regulate glucose transport into the body's cells and are crucial for energy production. Chronic pancreatitis : chronic or persistent abdominal pain and may or may not present with raised pancreatic enzymes. It develops gradually, often results in slow destruction of the pancreas. The main causes of chronic pancreatitis are gall bladder disease (ductal obstruction) and alcoholism. Other causes of chronic pancreatitis include cystic fibrosis, hypercalcemia, hyperlipidemia, some drugs, and autoimmune conditions. 2. Pancreatic Insufficiency : Pancreatic insufficiency is the inability of the pancreas to produce and/or transport enough digestive enzymes to break down food in the intestine and allow its absorption. occurs as the result of progressive pancreatic damage - It is most frequently associated with cystic fibrosis in children and with chronic pancreatitis in adults. 3. Pancreatic Cancer : Main Causes of Pancreatic cancer are chronic pancreatitis, and exposure to some industrial chemicals. Most (95%) pancreatic cancers are adenocarcinomas, developing in the exocrine tissues. Pancreatic cancer is very difficult to detect in the early stages because symptoms are either absent or nonspecific: abdominal pain, nausea, loss of appetite, and sometimes jaundice. 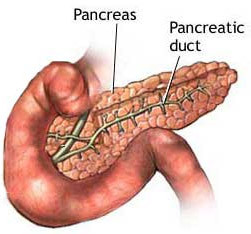 Only about 10% of the cancers are still contained within the pancreas at the time of diagnosis.